NEW YORK: A US military veteran with a criminal past — but no apparent terror motive — plowed a vehicle into a crowd of people in New York’s Times Square on Thursday, killing one person and injuring 22 others. Although the mid-day incident sparked jitters after deadly car-ramming attacks in London, Berlin and the French city of Nice, authorities said there was no evidence that the car crash in the heart of America’s most populous city was terror-related. “Based on the information that we have at this moment, there is no indication that this was an act of terrorism,” Mayor Bill de Blasio told a news conference at the scene. City authorities were nevertheless deploying extra police from anti-terror units to key locations around the US financial and cultural capital, home to 8.5 million, out of “an abundance of caution,” the mayor said. Richard Rojas, a 26-year-old from the Bronx stopped on two previous occasions for driving under the influence, plowed his Honda into pedestrians onto the sidewalk at 11:55 am (1555 GMT), smashing into people for three blocks. The vehicle collided with a pole and came to a stop at 45th Street and Broadway, police said. Smoke and flames spewed out of the hood as the injured littered the ground and passers-by sobbed, an AFP photographer said. A young woman was killed and 22 other victims were taken to hospital, De Blasio told reporters at the scene just steps from New York’s famed Broadway theater district. Four people were in critical condition, officials said. “He’s a United States citizen and a former member of the armed forces with the United States Navy,” the mayor said. Famous across the world for its bright lights and advertising billboards, Times Square — in the heart of Midtown Manhattan — is typically packed with tourists and office workers. Thursday’s incident began at the start of the lunch hour. Rojas’s maroon sedan vehicle, travelling at high speed, crashed into the group of people and ended up flipping onto its side on the sidewalk, before ambulances and police descended on the area, the AFP photographer said. The vehicle was on fire and one person lay covered up with a white cloth, he said. Police directed traffic as passers-by looked on anxiously. 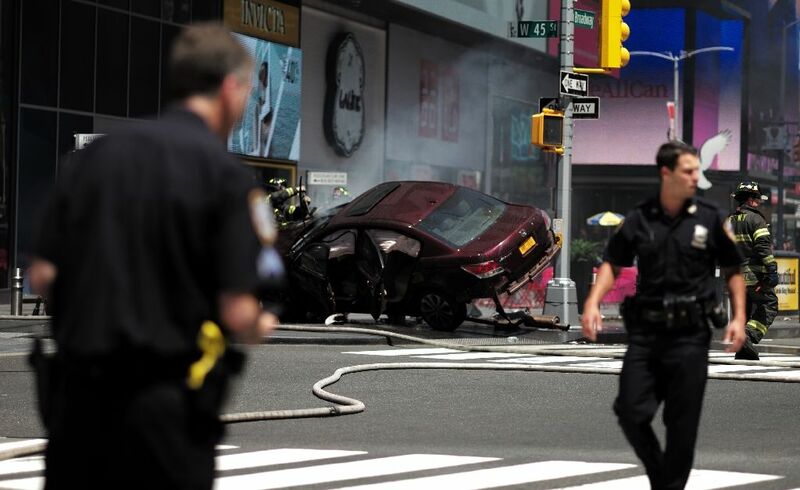 Times Square was the scene of the most serious security alert in America’s most populous city since the September 11, 2001 attacks when Faisal Shahzad, a Pakistani immigrant, planted a car bomb at the intersection on May 1, 2010.